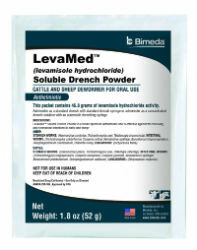 LevaMed™ (levamisole hydrochloride) Soluble Drench Powder is a broad spectrum anthelmintic and is effective against the following nematode infections in cattle and sheep: Stomach Worms, Intestinal Worms, and Lungworms. It has a short withdrawal time: Only 48 hours in cattle and 72 hours in sheep. This packet contains 46.8 grams of levamisole hydrochloride activity. For use with 20 mL Automatic Syringe. Place the contents of this packet in a standard household measuring container and add water to the 8 3/4 fl oz level. Swirl until dissolved. Give 2 mL (milliliter) per 100 Ib. body weight. For use with 20 mL Automatic Syringe. Place the contents of this packet in a standard household measuring container and add water to the 17½ fl oz level. Swirl until dissolved. Give 2 mL per 50 lb body weight. Careful weight estimates are essential for proper performance of this Prepare solutions as needed. However, excess solutions may be stored at up to 25°C in clean closed containers for up to 90 days without loss of anthelmintic activity.